It is officially called Colony Collapse Disorder, but a more pithy way of describing it would be Vanishing Bee Syndrome. All over America, beekeepers are opening up their hives in preparation for the spring pollination season, only to find that their bees are dead or have disappeared. Nobody, so far, knows why. The sad mystery surrounding the humble honeybee - which is a vital component in $14bn-worth of US agriculture - is beginning to worry even the highest strata of the political class in Washington. "Hillary Clinton's got interested in this in the last week or so," said David Hackenberg, the beekeeper leading the drive to publicise their plight. "And she's not alone," he said. "There's a lot of Congressmen have called...wanting to know what's going on. It's serious. "It's not just affecting the beekeepers, it's affecting the farmers that produce the food, and in the end it's going to affect the consumer," he added, sighing deeply. What makes our interview slightly surreal is that we are standing next to an orange grove, in rural Florida, while about 70 hives of bees buzz angrily behind us, as if to emphasise their predicament. Mr Hackenberg is suffering along with his bees. Like many in his rather neglected profession, he and his son spend the summer and autumn in the north of the country, driving their bees down south during the winter, to kick-start the early fruit and vegetable crops. 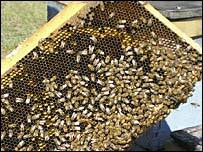 In a matter of weeks, he lost just over 2,000 of his 3,000 hives. 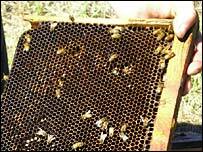 The yard of his small honey farm near Tampa Bay, is littered with empty boxes, which normally would be full of worker bees, doing what they do best. As we speak, his mobile phone chirps constantly, with yet more beekeepers across the US, reporting losses of up to 95%. Federal scientists, the National Beekeepers Association and state researchers have come together to form an emergency working group to try and halt the disastrous trend. There are as many theories as there are members of the panel, but Mr Hackenberg strongly suspects that new breeds of nicotine-based pesticides are to blame. "It may be that the honeybee has become the victim of these insecticides that are meant for other pests," he said. "If we don't figure this out real quick, it's going to wipe out our food supply." Just a few miles down the sunlit road, it is easy to find farmers prepared to agree with his gloomy assessment. In the old days, crops would be pollinated by bees living in the woods around the fertile fields, but housing developers have gobbled up much of the natural habitat, according to Carl Grooms, who runs Fancy Farms Inc.
"The squash crops that we grow have a male and female bloom, and the bee has to visit...to make it pollinate and produce," he said. "We're going to have a hard time finding rental bees to aid in this pollination and if it's as critical as it looks like it will be, I probably won't even plant anything this spring." 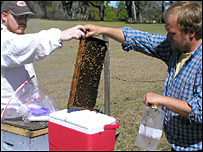 Back at the Buffy Bee honey farm - the Hackenberg's Florida base - two members from the working group checked in to pay their respects, and take some bee samples on their way back to Washington. Dennis van Engelsdorp, a Pennsylvania-based beekeeper and leading researcher, walks over to an isolated group of hives, and pulls out two different wooden frames that would normally be covered in bees, busy making honey. The difference is obvious. While one is teeming with insects, the other is virtually uninhabited. "The adult population totally disappears," he said. He shakes his head in frustration. He runs through the long list of possible causes, ranging from new mite infestation to new chemicals, but he is adamant that it is too early to pin the blame on insecticides. "We have no evidence to think that that theory is more right than any other...There's stronger evidence for some other things really," he said. He points to the fact that the Colony Collapse Disorder is inconsistent even within localised regions. 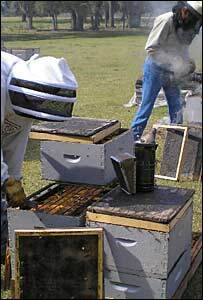 Some beekeepers have managed to retain completely healthy hives. 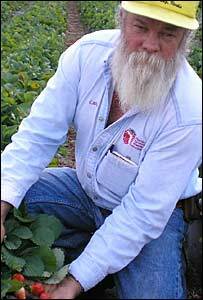 His caution is backed up by Nathan Rice, from the Department of Agriculture's bee research laboratory. "While there is a lot of this crazy guessing going on, people get kind of concerned," he said. "We're here to try to figure out why it's happening." The sensitivity of the beekeepers themselves is easy to understand. For the Hackenbergs, their livelihood is at stake, not to mention the millions of bees that have died. David Hackenberg's son, Davey, 35, is angry and frustrated that there are no answers yet. "We're working hard at it every day, and we're going to keep working hard until the bank comes and says, 'hey, we're taking the place,'" he says with a defiant edge. As a father of four, he thinks that the time may have come to get out of the bee business. Tales abound around the Hackenberg breakfast table of beekeepers who have already given up after a calamitous few months trying to pollinate the huge almond crop in California. Some bankrupt beekeepers do not have the money to get themselves home, let alone their equipment. A bumper-sticker on one of the family trucks shows support for the Bush-Cheney ticket in the 2004 election, but Davey is now wondering whether anywhere near enough has been done by governments - and everybody else - to keep his fragile industry and environment going.